A new non-invasive Skin Tightening and Lifting using a newly-developed machine based on High Intensity Focused Ultrasound. The effect goes into the deepest layer of the dermis, lifting and plumping the skin, creating a youthful look. No damage to the upper skin layer, no downtime, and no side effect, just a little pain and hot feeling. New technology in anti-aging care with an instant effect, this treatment is effective in skin tightening without surgery. With micro needles as RF energy conductor, fractional RF can reach deep into the skin for dermal remodeling, stimulate new collagen synthesis, increase skin suppleness, reduce fine lines, crow’s feet, smile lines, eye puffiness and tighten the skin around the neck. It is completely safe. A safe and comfortable treatment to stimulate collagen synthesis from the bottom of the outer layer skin with a Bi-Polar RF and Suction Pump. The formation of new collagen fills and strengthens the skin. The skin looks younger and more radiant, very effective for eyelids to reduce wrinkle, puffiness, and dark circles. The combination between infrared laser and bipolar RF which penetrate into the dermis to stimulate the synthesis of collagen and elastin. After treatment, the skin looks firmer, is more resilient, and has fewer fine lines. Suitable for sagging skin with fine lines. Peeling soothes inflamed-acne and brightens skin. Crystal Aluminium Oxide to remove dead skin-cell and clean up clogged pores for bright and young-looking skin. 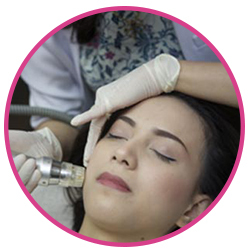 Diamond Peel Softens, cleans skin surface, and removes black/white heads. 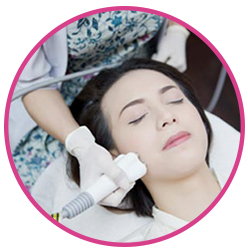 A unique Fractional procedure with RF which produces Microthermal Treatment Zones to form fibroblast and regenerate collagen. Effective in improving skin texture and elasticity. Suitable for acne prone skin with scars and large pores. New technology and innovation to fix skin problems caused by vascular disorders (natural or temperature reactions), allergic, irritation, and medication side effects. Vasculite removes all the spots that cannot be treated by regular treatments. The scanner with contact cooler is computer-driven. 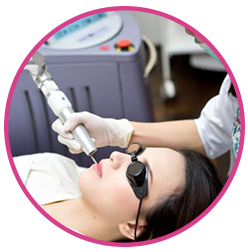 This treatment is very effective and safe, non-invasive with no-downtime. Suitable for anyone with hyperpigmentation and blood capillary problems. 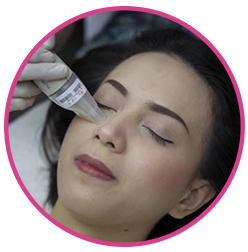 The result can be seen after treatment: Capillaries are reduced instantly, and the skin looks more radiant and even. Through Bio-stimulation and melanin dispersion process, this painless and non-invasive treatment instantly clears any kind of hyperpigmentation. The redness is an after-effect of treatment and will disappear after 30-60 minutes, suitable for every skin problem and any skin color , on the face, neck, arm, foot, and armpit. For the first treatment, the skin instantly looks more radiant. Proven to combat freckles, melasma, lentigo, even out the skin tone, and brighten the skin. 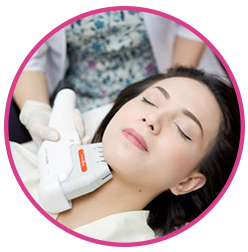 A combination of Bipolar RF and Laser technology to reduce the body’s ability to regrow hair follicles. 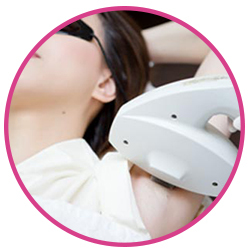 This treatment results in a depilation or permanent hair reduction whether you want to get rid of your unwanted hair on your underarm, face, Brazilian or any other area. 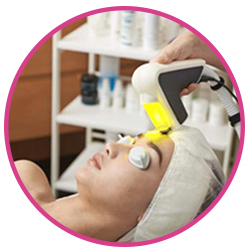 This treatment will also regenerate and brighten skin and minimize pores. This innovative slimming technology combining multi polar RF and micro-current tightens skin, reduces wrinkles, contours faces, and reduces fat deposit. This effective, safe, comfortable treatment can be done on the face, neck, arm, belly, thigh and buttocks. The first and only technology in Indonesia that effectively shapes and firms the skin and at the same time significantly reduces cellulites and stretch-marks. 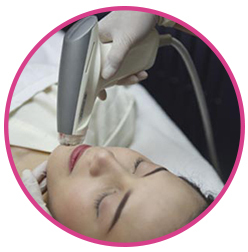 With shockwave technology which has been known in medical treatments for decades, this treatment is totally safe.